The good news when you sew jersey, stretch or knit fabrics is that the patterns are much simplier than for a non-stretch fabric. Almost no darts. Nevertheless, if you want to make a made-to-measure garment, you still need pencils, calculator and a curved ruler. Here’s how you can simply realize the pattern of a jersey bodice. The front and the back are done in the same time. I suppose that you have already taken the following measures: waist, bust, hips, height of the hips, arm-to-arm chest width, arm-to-arm back width, round neckline, shoulder length, front neck-to-waist and back neck-to-waist. EG = GH = 1/6 round neckline. On the bissecting line EG / GH, measure 2.5 cm and draw the front neckline with the curved ruler by observing a 1.5cm flatness from the center front. Draw an horizontal line FI. 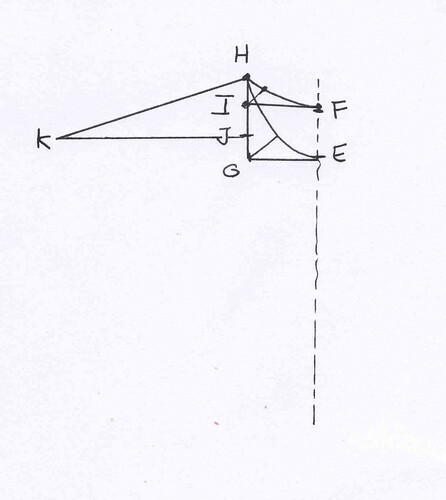 On the bissecting line FI / IH measure 2.3 cm and draw the back neckline HF by observing a 3 cm flatness from the center back. Place J to have GJ = 1/3 GH. From J, draw an horizontal JK in order to have HK = shoulder length. B1C2 = (front neck-to-waist + back neck-to-waist) / 4 + 2.5cm. Draw the front armhole curve KD1C2 and the back armhole curve KD2C2 by obseving 1.5 cm flatness for the front and 1 cm flatness for the back from C2. Your pattern is now completed. You do not need to add the ease as the jersey tends to ease up already. Try your pattern and adjust the armhole curves if necessary. This method is taken from the pattern-making book of Teresa Gilewska. I just changed the curve of the back neckline; in the book it is more tricky. For the first try of this pattern do not choose a cheap jersey and go for something like the wool jersey, which is a bit more expensive more firm than a simple cotton jersay. So, how do you feel about this method? Rocket-science or not? This entry was posted in Patterns and tagged basic shell, stretch. Can you show how to sew a PORTRAIT collar. Its the one that sits on the edge of the shoulders and folds down about 3 inches. is there a stretch sleeve pattern that can fit this one? Hi! 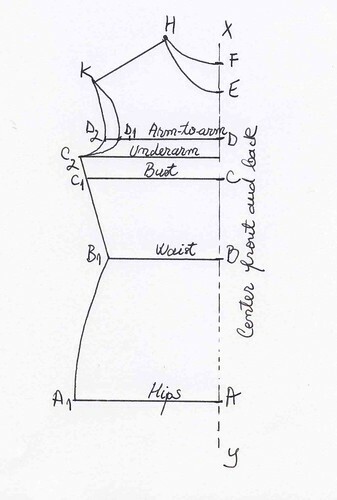 Thanks for sharing this post, I am going to try it as soon as possible since I like stretch fitting, though I had a doubt as soon as I started drawing: shouldn’t be the FRONT neck-to-waist longer than the BACK one, as you said in the “Drafting the bodice pattern” too? Thank you a lot! I can’t wait to try this new method! Hi Cristina, thanks for your reply. 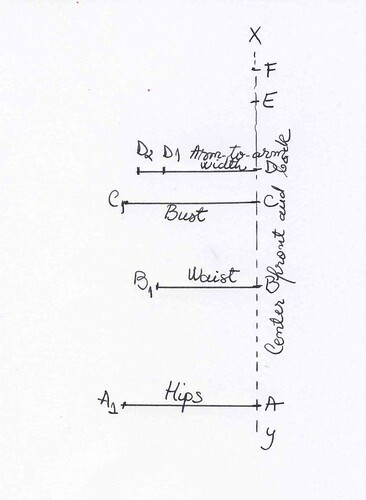 I could draft this stretch bodice (the back neck-to-waist is 3 cm longer), but I am trying to draft the basic bodice shell and I don’t know how to do it since the figure 2 shows that the front neck-to-waist is longer than the back one and the measurements I took were back 43cm and front 40cm. Thank you for your patient, I think I might have skipped something! excellent! I love the alexander mcqueen dress!